Free software updates for 12 months after your order. Free support for 12 months after your order. 50% discount for future orders of the same product (used for extra licenses and/or updates). Your private customer menu (explained below). You can see a summary of all your orders and details about each one. Here is where you download your software. You can also generate a discount code to acquire additional licenses at a 50% discount. Keeping your contact details updated ensures good communication between us. Using this link you can add a testimonial and request a new feature. nuevoMailer is customer-driven. Your requests are taken seriously. 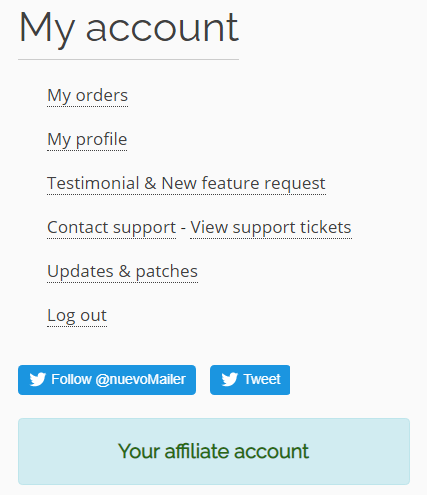 Dedicated support area where you can create a support ticket and in addition you can check the status of your ticket. When we discover a bug we post the updated files in this area. These updates are always specific to your version of the software.